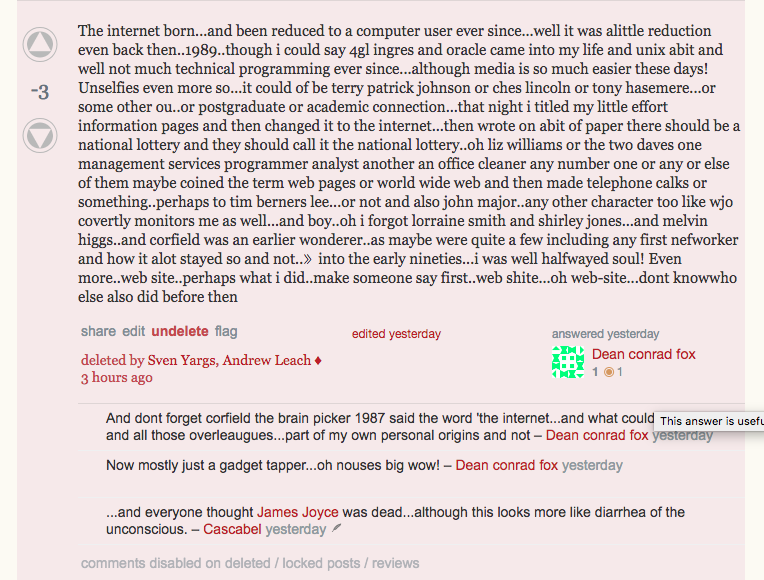 It reads like some drunken rant, in which it appears he claims responsibility for coining the term "internet". My flag was marked as "helpful", and yet, there it is. So, we could ask: What happens to VLQ flags? How long do they last? How many people need to flag as VLQ for the system to take action? And if a minor edit to a question or answer after being flagged renders the flag ineffective, how do we avoid this misuse of the system? If you flag a post as VLQ, the post is moved to the VLQ Review Queue. Once a post is in the VLQ review queue, it is simply down to the reviewers. Once the appropriate number (I believe it is six on ELU) click on Recommend Deletion within the review process, the post is deleted. Or, of course, if the consensus is Looks OK, the post leaves the review queue and is kept. This answer on the Main Meta has more details. The NAA (Not An Answer) flag also puts the post into the VLQ review queue but also raises a notification to the moderators. In this case the moderators are more likely to see the post, and delete if necessary, but NAA requires different criteria to VLQ.